Despite having a first class ticket to ride, some of comics best concepts often miss the train and end up in four colour limbo, all but forgotten. Fortnightly in Lest We Forget, I pluck one of those limbo-lingerers, pimping their need for a comeback. Today, it's Ladytron. 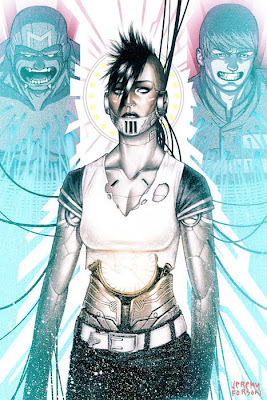 A throwback to 80's CyberPunk, Ladytron is three times as wicked. 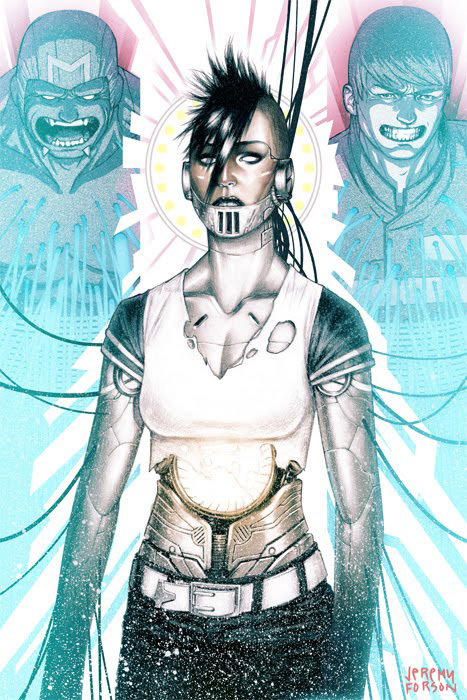 Not just an awesome visual in herself, the attitude of this smoking, ball-breaking, mohawked marvel makes her stand out from any other female anti-hero - and you know you can never have to many cyborgs! An abusive childhood doesn't cut you much slack with the FBI when you've turned to a life of murder and crime as a result. In Maxine Manchester's case it got her riddled with bullets, and handed to a mad scientist named Doctor Katz for spare parts. Now running on an internal nuclear reactor with a sonic blaster in her mouth, Maxine was forced to kill Dr Katz's other cyborg creation, her husband Stanley, who she married between crime sprees. Captured and re-educated by the WildC.A.Ts, the once psychopathic Maxine still managed to retain much of her anti-social and sometimes savage bite. Still, her strength of will and muscle didn't stop her being torn apart - literally. After being taken to the Church of Gort (a cult for cyborgs, robots and A.I's) for repairs, Maxine reemerged more committed than ever to protecting life - including that of machines, whose she viewed as equal if not greater, than that of any sentient being. Sure all of that is up in the air with the new DC 52 title relaunch - but the facts don't change. 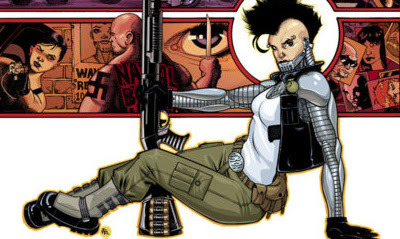 With guns mounted in her arms and an attitude that would give Bats a run for his millions, there is no way a character this spicy should stay on the shelves gathering dust! HOW I’D PLUG LADYTRON IN TO THE NEW DC: Every gunslinger needs a sidekick and Grifter is no exception! Sure the solicits for September's Grifter #1 say he's declaring war on monsters only he can see, but blowing stuff up and causing chaos to kill invisible monsters is just the kind of madness that puts LadyTron in drive! Enough about me, after you've finished drooling over the image by Jeremy Forson above left, what do you think? the narrative of this character reminds me a bit of a sci-fi short story i read back in high school called "Night Shift". in this story they turn convicted criminals into cyborgs to help enforce the law. part of the deal is that they have to under go daily reliving of their crimes that was described as being their "medication". after "X" amount of years they finally reach the sentenced served status and are considered to have payed their debt to society. I realize that it's just comics but I've never understood the logic behind the whole "lets take a criminal and punish them by giving them incredible super powers!" What do they THINK is gonna happen?! LOL I'd hate to see what the Wildstorm version of Ted Bundy was like. They probably gave him the ability to set things on fire with his mind. I like Ladytron. I'd never heard of her before now. However if I had my druthers I'd vote to bring back The Doctor! If there's anyone I'd like to see in the new Justice League it's him. You know Pensol I've never thought of it that way but you are so right!! Stupid authority figures! Speaking of Authority The Doctor is definitely a good pick - If I was a betting man I'd be looking at Stormwatch for the guy to jump up in come September.